Truly a gold mine for students of film, film history and African American history, the Criterion Collection makes classic films available on the consumer market in contemporary formats. 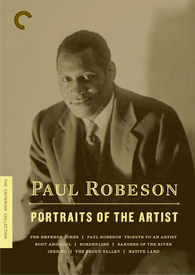 In 2007, they released a four-DVD set containing highlights of the film career of American legend Paul Robeson, divided into four categories: Icon, Outsider, Pioneer, and Citizen of the World. Also included is a high-quality booklet explaining the place of each film in the larger contexts of American film, avant-garde film, Black film, and progressive film. Easily the best known of these is the screen adaptation of Eugene O’Neill’s “The Emperor Jones” (1933, dir. Dudley Murphy), whose moral that “power corrupts” rings as true as ever. The documentary “Paul Robeson: Tribute to an Artist” (1979, dir. Saul J. Turrell) has its moments, but one would do better (though harder work) to read Martin Duberman’s biography of Robeson. There is not much new here. “Body and Soul” (1925, dir. Oscar Micheaux) and “Borderline” (1930, dir. Kenneth Macpherson) offer perhaps-surprising glimpses of Black and post-surrealist cinemas. “Sanders of the River” (1935, dir. Zoltán Korda) and “Jericho” (1937, dir. Thornton Freeland) come from the peak of Robeson’s commercial career as a screen actor, and represent in their ways the bitter lessons of what a marketplace can do to one’s attempts to express cherished ideals. From the progressive point of view, the peak of Robeson’s work as it is presented here is undoubtedly “The Proud Valley” (1940, dir. Pen Tennyson) and “Native Land” (1942, dirs. Leo Hurwitz and Paul Strand). “The Proud Valley” was dear to Robeson as an expression of the close camaraderie he felt with the coal miners of Wales. “Native Land” represents the peak product of a series of American film collectives with their common roots in the Communist Party’s “Workers Film and Photo League,” a brief attempt in 1933 and 1934 to “work collectively in an independent organization pledged to ‘conquer the film’ for the working class.” Narrated by Robeson and intended to be a searing indictment of the crypto-fascism of anti-union violence in 1930s America, it took four years to make and upon its release in 1942, it was out of step with war-driven imperatives for maximum production. Everyone came home just in time for the second “red scare,” and this film never got its fair showing to the American public. Its poetic cinematography and rhetorical flights and its stirring recreations of actual events all represent the heavy influence of the heyday of Soviet cinema on the production collective — another film legacy never properly seen in America, for having been classified “Communist propaganda” and banned for import. Robeson’s increasing role both in producing and in artistic direction mirror his natural evolution as a committed artist and political activist. Robeson’s long bitterness eventually turned to outrage, then to action, as his rising awareness of the misrepresentations and slurs against African culture (particularly in the English-speaking world) were consistently undermined by movie-executive pandering to cultural prejudices of the time. One can clearly see the arc of this development in these seven selections from Robeson’s oeuvre. However, this development is not linear — Brutus Jones rules in full confidence; the Rev. Isaiah T. Jenkins is fully a product of unmediated African-American culture; Pete is definitely wronged by the racism he encounters, though not from everyone, in “Borderline.” Rather, one might say that Robeson’s career became affected by his activism in a dialectical manner. Faced with the contradictions of his own material success and the sometimes-harmful images of his own people that his work directly produced, he naturally sought over time situations and partnerships that would allow him to maximize his control over the final product. Naturally enough, given his politics and cultural values, this sometimes meant putting his own money where his heart was, and at least sometimes, meant collective production situations. The booklet makes clear that Criterion’s offering leaves off just at the phase where Robeson’s work becomes most brazenly political — short films for the Marcantonio and Wallace campaigns, and other works against the dawn of the Atomic Age. Given how much of the collected material came directly from high-quality, preserved films or film negatives in the possession of the George Eastman House, the British Film Institute and so on, this does not bode well for the ready availability of the most politically articulate part of Robeson’s work — the part in which he was at full consciousness, and in which he gave that consciousness full articulation. This is also a perhaps-inevitable by-product of a production by well-meaning outsiders. Full respect is given Robeson’s Communist “sympathies,” but not full voice. “Native Land,” in particular, is a must-see tease for what remains buried in the vaults. Therefore, while the situation is not the “fault” of a fine effort like that of the Criterion Collection, it does point the way forward for those of us interested in the retrieval and dissemination of the full range of Robeson’s voice and thought. That is perhaps the real achievement of this collection. On the one hand, there is the work to locate and to secure the actual physical remains of these efforts. On the other hand and perhaps more centrally, it points to the very sphinx at the end of the trail that Paul Robeson blazed. He and a few others left a towering legacy that was abandoned in its time and under duress, a legacy that has never been excavated fully, and has never been further developed. “Native Land,” in particular, points to a whole new branch of documentary filmmaking, one effectively shut down by the House Un-American Activities Committee’s indictments of the first “Hollywood Ten.” Yet now, it is only the rare film-student researcher (or hip film professor) that even knows of these lost masterpieces. Each such film represents a high-impact communications weapon that was taken from the working class under the vilest of circumstances, and has been held ever since like so many Native American sacred objects in the basements of Smithsonians, whole continents and decades removed from their rightful owners, the people of the world. There is no telling what a new generation of filmmakers would make of these proud traditions, unless we find a way to deliver this artistic birthright to them. The Criterion Collection, Catalog Number: CC1676D, ISBN: 1-934121-19-3.